30 Aug Extraordinary Sundays – Pushing Boundaries and Living a more Adventurous Life. Extraordinary Sundays are all about our philosophy of pushing boundaries living a more adventurous life. This is a great way to get out of your comfort zone, surrounded by mates going through exactly the same experience as you, in a fun but challenging environment. Once per quarter we pick one activity that’s a bit different and based around challenging your perception of what you are mentally and physically capable of. It could be map and compass navigation in the heart of the blue mountains, a high ropes course, a wet or dry canyoning trip, or outdoor rock climbing for example. Some months you may turn up to one that is not quite so challenging for you, something that you’ve done before, which is great as you can lead and help your Basecamp mates with their journey. When was the last time you really got out of your comfort zone? Felt nervous about the uncertain outcome of a challenge? We want you to push your boundaries and leave feeling liberated and proud. It’s about teamwork, personal leadership, facing your fears, learning new skills and self-belief. So come on, take a leap of faith! 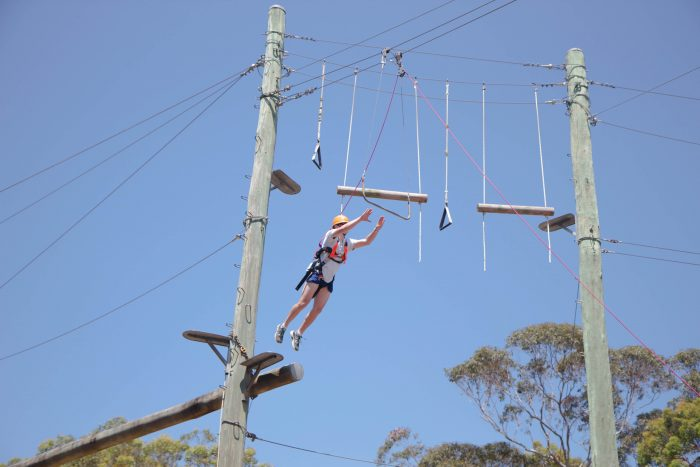 Our first one is a high ropes challenge and will take place 9am Sunday 24th September at the Sydney Academy of Sports in Narrabeen. We’ve got a great group going and it’ll be a lot of fun. Price is $65 for Basecamp members and $85 for non-members. If you are on Facebook join our event to stay up to date and register your attendance by using our contact page – spaces are limited so get in quick!